Three of the 4 main Aussies colors are represented here with blue merle, red tri and black tri. Of course for main body colors we just call them blue merle, red and black. The other is red merle with or without copper and/or white. Sometimes the color site doesn't load properly, and if this happens to you try reloading it. 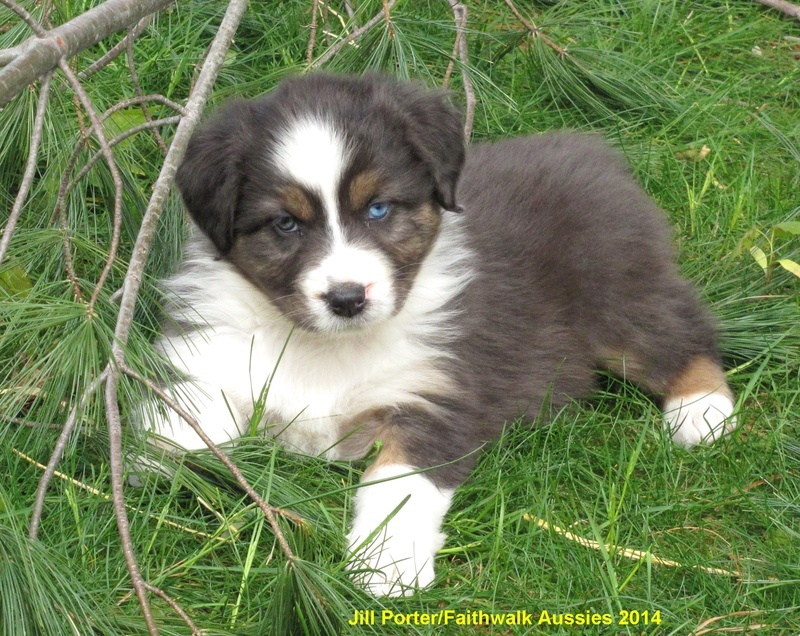 Many people new to Aussies may not take the time to learn about color genetics in the breed. It is important though, as it does have something to do with the health of puppies produced. The merle gene is a dominant one (M), while the solid colored body (tri, bi or self color) is recessive (m). If you breed two merles together, even if they were the product of merle to tri breedings (Mm), about a quarter of their puppies could inherit the dominant merle (M) gene from both parents, making them MM. These pups will have a very high chance of being blind and/or deaf, and are often more white in color than their siblings. These are called "pattern white" as they have more white than color or white markings in areas they should not, as per the breed standard (such as on the body). The white markings themselves are not always the issue, other than they don't meet the breed standard for color and markings. The exception is in pups lacking color pigment on or in their ears as they have a higher chance of being deaf. The MM pups may have deformed or small eyes, or even no eyes at all. Many breeders avoid this issue by simply never breed two merle dogs together. Some MM pups are marked "correctly" but may still be deaf. Breeding a merle to a solid color (tri, bi or self-color red or black) will produce normal puppies, and breeding to solid (mm) parents (tri, bi or selfcolor red or black) will produce all solid pups. 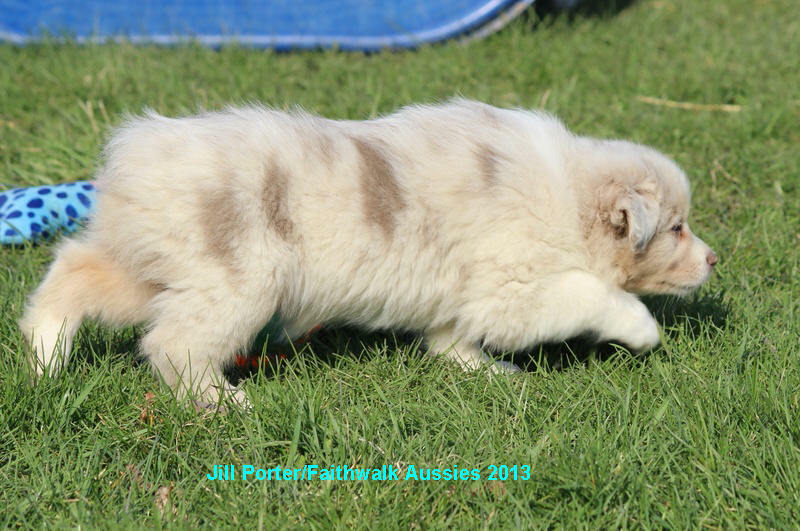 Some Aussies also carry a gene for body white, which can occur in merle to tri or tri to tri breedings, and shouldn't be confused with pattern white pups produced in merle to merle breedings. Those pups may not meet the breed standard, but they won't have a double dose of merle and any associated problems. It should also be noted that since merle is dominant over solid (black or red) that when you breed a solid (self black or red, bi or tri) to a merle, it is the MERLE dog that determines the color in the pups. The solid parent can only produce solid pups (self color, bi or tricolor.) And on a related subject, it is the mother who determines the number of pups since it is her body that releases a certain number of eggs. The male determines the sexes of the pups. So if you breed a blue merle female to a black tri male, and get 4 males and 4 females, you know the male determined the sexes and female determined the numbers. And if there are 5 merles and 3 tris, you will know the merle parent (in this case the merle mother) produced the number of merles and the number of tri pups! Also, red is a simple recessive to black, so solid reds (tri, bi or self red) will be recessive to black, and red merle is recessive to blue merle. A blue merle dog is actually genetically black, but with the dominant merle gene which reduces some areas of black to a silvery blue, which can vary from a very pale shade to a darker steel blue. For a puppy to be red, it will be (bb). A black puppy who is red factored, which means it is black but carries red is (Bb), and a black puppy who does not carry red is (BB.) This is true of solid or merle pups. Think of blue merle pups as black ones with the merle gene, and red merles as red pups with the merle gene. Here is a red tri Aussie showing some sun bleaching in his coat, which is common in reds. Once this coat sheds out and a new one grows in, it will be the richer color he is genetically. To avoid sun bleaching of coats of red Aussies, one can keep them out of the sun most of the day. I also think diet helps, as having a healthy coat will help reduce some of the bleaching. The addition of copper or tan points and white trim is also inherited, but not related to whether the dog is merle or solid. 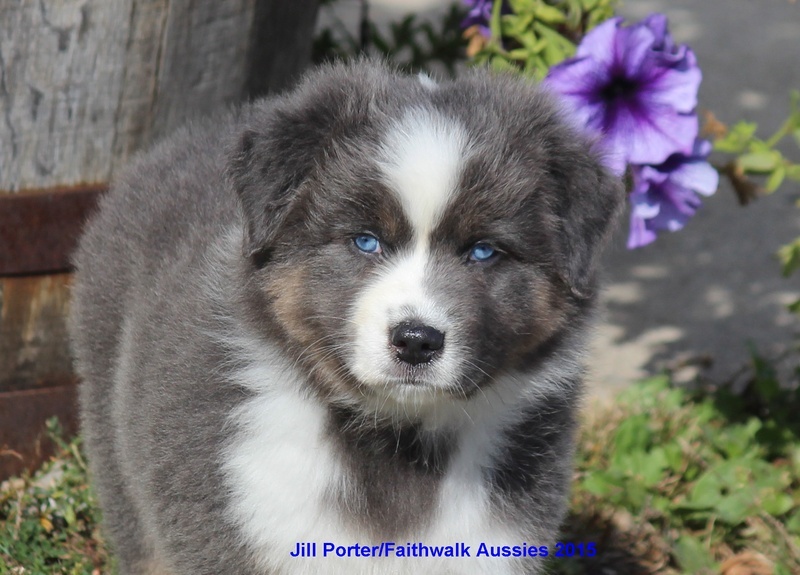 Aussies who have no copper and/or white may equally meet the breed standard as those who have one or both. 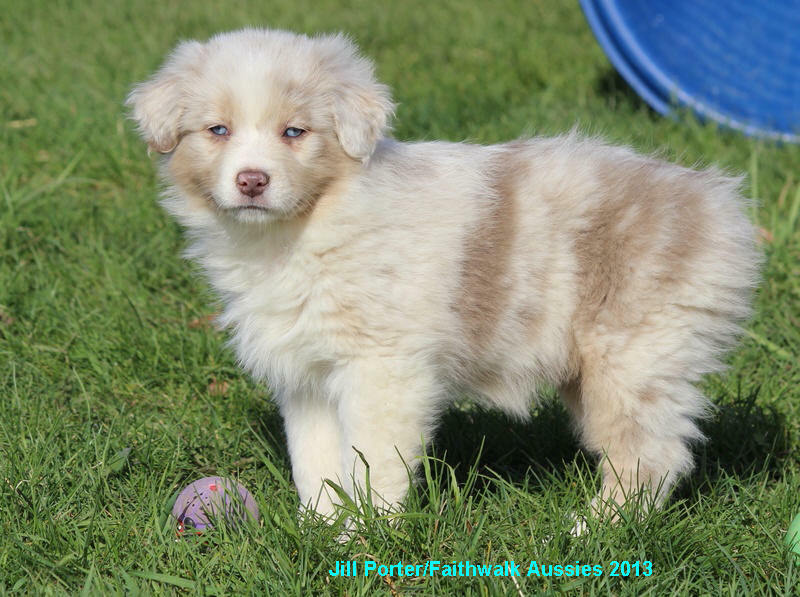 I have been collecting photos of dilute Aussies to add to this page too. My favorite is a red merle dilute as that combines two recessives (red "b" and dilute "d) in addition to the dominant merle gene. She's just a puppy here but I hope to post photos as she grows. This is different than having a dilute spot or two as her solid areas are dilute as well as her nose, lip and eye rim pigment. Here is a dilute black tri pupy. Instead of being black coated with black nose and eye rim pigment, she is a steel grey. In this case the pup also has one blue eye but that is not related to the dilute coat color. Some call this color blue tri but dilute black more accurate. It is a simple recessive and is the D Locus. 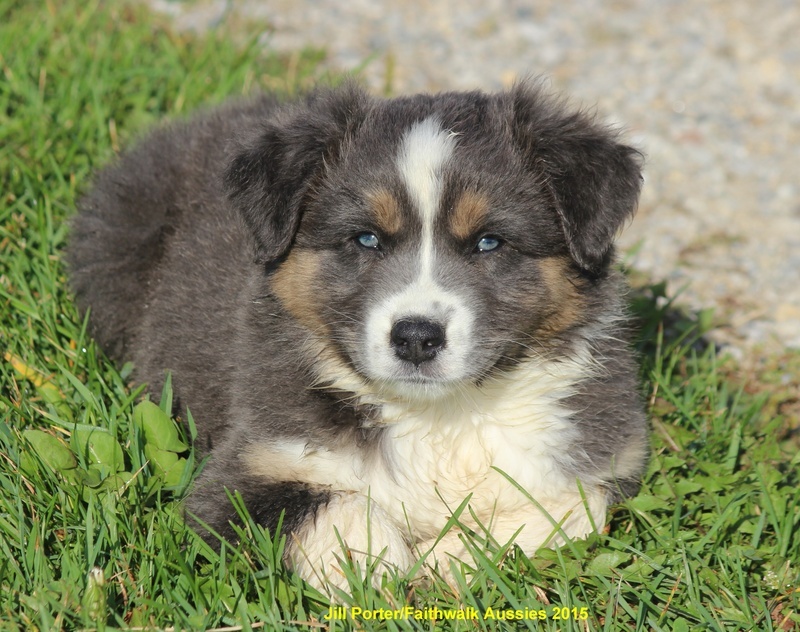 Below is a dilute black tri puppy with what will be amber eyes. They look bluish at this age. Like with reds, dilute puppies will have a lighter eye color than their non-dilute siblings, unless the eyes are blue. It is good to educate yourself about the colors in this breed, before you set out to pick a puppy. Even if the puppy is going to be a pet to be spayed or neutered, knowing how to choose a healthy puppy in regards to color genetics is a good idea. Getting a puppy with a "mismark" may still mean you get a healthy puppy, but you need to know how to determine that. Your breeder should also be able to tell you more about the subject. I would recommend only breeding a tri to a merle, or tri to tri for an all tri litter to avoid the issues with merle to merle breeding. I am also adding more info on this subject to the page below this in the sidebar, the "Eyes, Pigment, Markings" page. I have added a lot of photos and more detailed information. "Ask and it shall be given to you; seek and you shall find; knock, and it shall be opened to you. For everyone who asks recieves. and he who seeks find, and to him who knocks it shall be opened."